Black Stars of Ghana and Atletico Madrid defensive midfielder, Thomas Partey has given Iceland some tips on how to beat the Super Eagles at the fast-approaching FIFA World Cup in Russia. The Black Stars will not be at the World Cup party in Russia after finishing third in Group E of the African qualifiers. 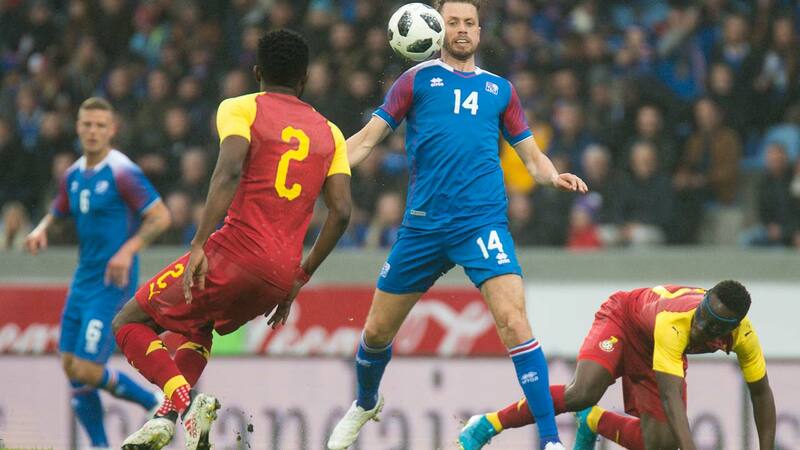 They played against Iceland yesterday evening in a pre-World Cup match in Laugardalsvöllur (Reykjavík). Partey, who was part of Atletico Madrid’s squad that defeated Super Eagles B Team to win the GOtv MAX Cup in Uyo, Akwa Ibom State on May 22, is well acquainted with Nigeria’s style of football. Speaking to journalists ahead of their friendly match yesterday, Partey said that Iceland could do the damage against Super Eagles at the World Cup by capitalizing on the team’s weakness in defending set pieces. ‘’All teams from Africa have high speed and power. However, they tend to be unorganized. The weaknesses of the African team consist mainly of permanent play,’’ Partey said. The Super Eagles will face Iceland at Volgograd Arena on June 22 in both countries second Group D match in Russia. Meanwhile, some key Super Eagles players did not take part in training yesterday. According to allnigeriasoccer.com, the players that were involved for more than 60 minutes in Wednesday’s friendly versus Czech Republic did not participate in full training yesterday morning and they continued their recovery sessions in the evening. The likes of Victor Moses, Alex Iwobi, Obi Mikel, Leon Balogun, Brian Idowu, William Troost-Ekong, John Ogu, Wilfred Ndidi and Odion Ighalo went through running sessions and Yoga, while the rest of the team worked normally. The players had a gym session and exercise in the swimming pool indoors at the Avita Resort in Bad Tatzmannsdorf yesterday evening. It was confirmed that all the players that featured against Czech Republic were injury free. Nigeria will take to the Arena Baltika, Kaliningrad pitch in their World Cup opener against Croatia on June 16. The Super Eagles failed to win their last four pre-World Cup friendlies against Serbia, Democratic Republic of Congo, England and Czech Republic.